Urging my laptop to life, there were no inklings of the magic it would soon dispense. No hint of the hidden connections that lay within. Nothing to reveal the memories it would unleash. The usual plethora of overnight emails swarmed my inbox, parading up the screen as they entered. Sifting through the usual jungle of unwanted solicitations, the day’s local news headlines, and legitimate email exchanges lay an unassuming subject from a sender I didn’t recognize. “Using an Image” it said. Once I had dispensed with the known correspondences, I opened it. And smiled. Then smiled even more. A five year old photo of mine had caught the attention of a stranger. It was part of a blog post from our first year as lighthouse keepers for Crisp Point Lighthouse, when each day brought new perspectives for photographing that magnificent structure. 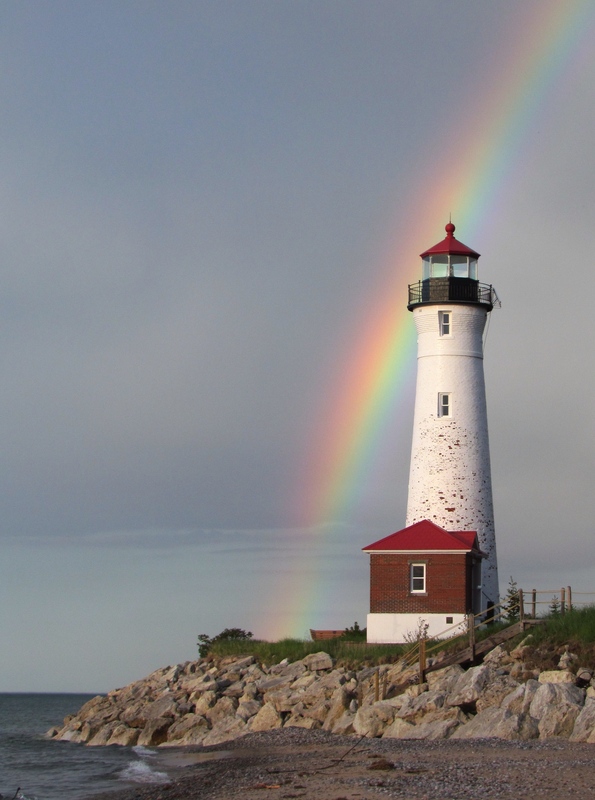 In this image the day’s lingering light illuminated the lighthouse against a gloomy background, behind it the arc of a rainbow stretched skyward. It was the light that attracted Sarah’s attention. I have no idea how she found the photo. I dug through blog posts from six stints of light keeping before I spotted the picture she described. I was tickled that she wanted to use it and immediately granted permission. But the magic still lay within. Sarah’s email began, “Good morning from a rather gloomy north east England.” That was the first smile. She went on to describe her interest in the photograph, to use for a monthly parish magazine she produces called Crosstalk. The theme of the next issue was “Light,” and she felt it would make a fitting cover image. She described the magazine’s circulation as “around 300 copies across three parishes in and around the City of Durham.” That was the second, bigger smile. 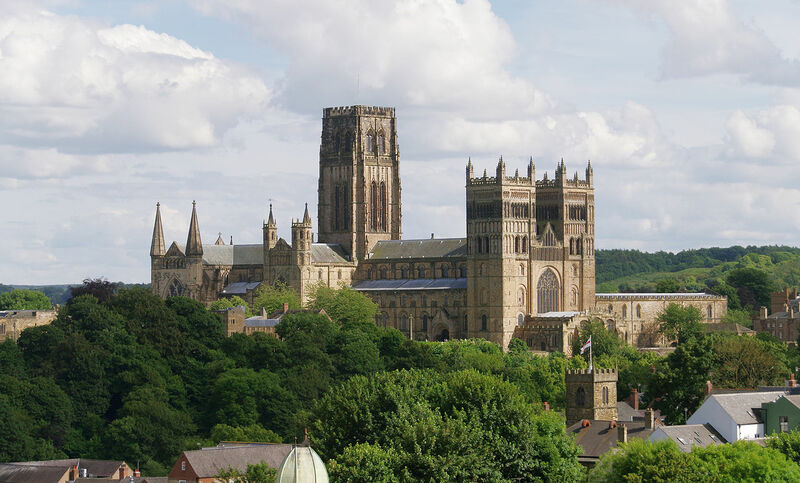 I spent my junior year in college studying at the University of Durham. As one of only 40 Americans immersed in a university population of over 4,000, I relished the opportunity to live the life of a British student, embraced the unique college system and relished the beauty and culture of that historic city. The best feature of my dorm room was the prominent view of the majestic cathedral through its single window. I made lasting friendships and developed a love affair with Britain that I have sustained through frequent return visits, including another stint to do a master’s degree at the University of Bath. Fond memories came flooding back. What are the chances? That Sarah would find my photo. That she would be from my favorite city in Britain. And that she could so easily reach out to me directly. A rapid-fire email exchange ensued, in which we uncovered more connections and interests in common. The warmth of the new bond filled my soul. The internet often gets a bad wrap. But in this case it made my day. Through cyber magic. This entry was posted in Life Up North, Travel and tagged Crisp Point Lighthouse, Durham England, Travel by Molly. Bookmark the permalink. Beautiful picture and awesome example of the power of the internet when used for connection, communication, creativity, and making the world a smaller place. Congratulations on the publication and the newfound relationship. Stay warm as Rich’s blog speaks of frigid temperatures throughout the region, kind of what I would expect from Great Britain. Have a great week. Ah. Serendipity at work. Marvelous.